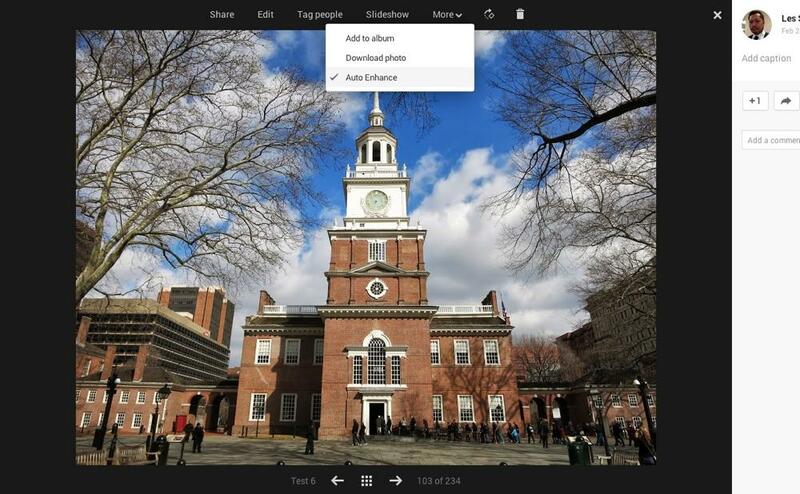 Hands on: Are Google’s new photo editing features a gimmick, or powerful software in disguise? With the new photo features, Google’s aim is to implement powerful-yet-automated tools that help users create better images. To achieve great looking photos, Senior VP Vic Gundotra said traditionally people use “powerful tools that require lots of skills that run on expensive machines and take a lot of time…time that many of us don’t have.” But Google claims that its new auto, one-touch features can pull off the same results (and more) without a lot of user input. “All you have to do is upload your images,” Gundotra said. Automatic photo editing features aren’t new – almost every photo-editing program, including Google’s Picasa, has a one-touch solution. But most of them don’t work that well. Google’s new features promise not only to work, but add a professional quality to them. Has Google finally figure out a way to help us refine and add some fun to our photos, not just dump them in the cloud? We took an early spin at some of these features. Here are our first impressions. The basic concept of Auto Highlight is that Google will help you sort through your vast collection of photos and showcase the best ones from a particular album. The software will weed out blurry, duplicate, and poorly exposed images. It’ll also select photos that it thinks are interesting or have some sort of relevance in your life. On stage, Gundotra demonstrated the feature with 600 vacation photos he took in New Zealand; we did not have that many per album, but we uploaded a fair amount to give the feature a proper whirl. After we uploaded the photos (which can take a while, depending on your upload speed, photo size, the quantity, and if it’s being enhanced), we noticed the software did a good job at picking out faces – even blurry ones – which you can tag right away or skip for later. Where it stumbled is actually highlighting what it considers to be the best photos. 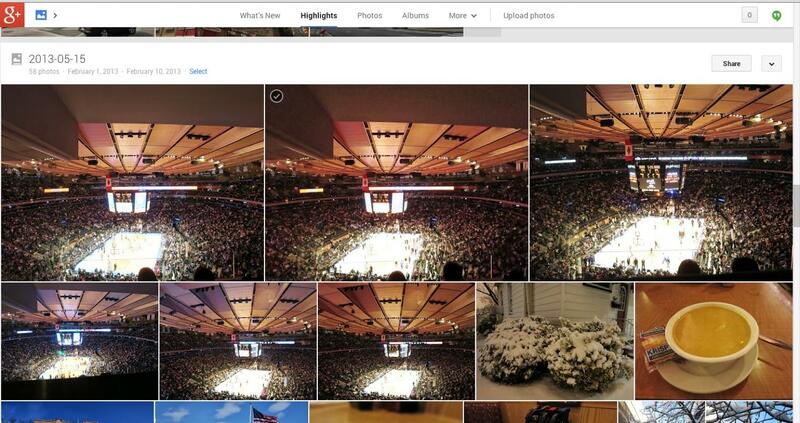 In nearly all our albums, Google displayed too many similar-looking photos. Some were blurry and some clearly had exposure issues. If we were to curate this front page of our best photos, we certainly would not have chosen what the software did. Out of the 139 photos in this album, Auto Highlight gravitated toward similar photos. It failed to pick out any of the shots of our friends. Auto Highlight picked six similar photos and placed them at the top. They aren’t even the best or most interesting photos in that album. In our tests, we found this feature to be a mixed bag. When you enable the Auto Enhance feature on a photo, it takes a few seconds to do its thing. Granted, we aren’t always the greatest photographers and we have plenty of bad photos, which we intentionally uploaded to see if Google can fix them. Part of the claim is that the Auto Enhance feature can fix photos with bad exposure or noise, for example (the process is entirely automated). We also uploaded some great photos (if we do say so ourselves) just to see what more Google can do to them. For most of our photos, Auto Enhance likes to simply oversaturate the colors and adjust the exposure and contrast to bring out some of the details. This can work well sometimes, but we found that in some situations it makes the colors look unappealing or increases the noise level. We tried it with a photo that was taken with a camera’s built-in high dynamic range mode, so the colors were already sufficiently pumped up; Auto Enhance pumped it up even more that the photo’s colors look even more exaggerated. In one photo, the colors were so amped in the objects around a rainbow that it looked lost. In a nighttime photo of a group of people, the faces looked washed out and actually lost some of the details in the original. With a photo of a beach scene, staring straight at a setting sun, Auto Enhance was able to bring up some of the details, but the noise level increased significantly. One of the things we have issues with when shooting indoors with a point-and-shoot is an ugly yellow cast produced by the lights. Auto Enhance is suppose to fix the white balance in photos, but it didn’t seem to offer any improvements with one such photo. In a nighttime shot that was already noisy and blurry, Auto Enhance only made it worse by increasing the noise and brightening areas that were already difficult to make out. Before (left) and after. Sometimes the enhancements are subtle. Perhaps it’s subjective, but we prefer the original on the left. The Auto Enhanced photo on the right gives the photo a toy camera vignette effect, but looks less natural. Auto Enhance increased the noise in this nighttime handheld shot (right) without really adding any benefits to the photo. Where it did work was a nighttime shot of the Chicago skyline. We had taken this photo on a tripod, so it was a clear photo that we were already happy with. Here, Auto Enhance increased the brightness as usual, but it worked. The skyscrapers’ enhanced lights made the buildings come to life, although we wish it had kept the night background darker. In a photo of Independence Hall in Philadelphia, what originally looked gray turned into a sharper image with a bright blue sky. Photos taken under cloudy or overcast skies benefit, too. The enhanced photo on the right now has some depth and made the skyline come to life. What makes a photo great is subjective. Some people really like the HDR intense color effect, while some think it ruins the photo. However, we felt that the Auto Enhance doesn’t always deliver its promises. It depends on the photos: sometimes it either added nothing special, or made things worse, but then there are photos that come alive when Google applies the enhancement. You’ll have to play around and decide if the enhanced photo is to your liking. Note, however, that the changes aren’t permanent; you can always revert back to the original. But the one nice thing we want to point out is that easy-to-use photo-editing functionalities like these help people realize that the photos taken with their phones and cameras aren’t always the end-story. You can always make a few tweaks to make them better (or worse). As the name might suggest, this feature is designed to help you view your photos in cool ways that you might never have considered, and it does it behind the scenes when you’re uploading the photos. Examples include automatically creating animated GIFs of photos taken in burst mode, collages of similar portraits, implementing HDR, and more. There’s no button to press; Google automatically does it for you. At first use, we couldn’t find any examples of these features in our albums – granted, our albums may not contain thousands of photos, but we did upload some burst shots and portraits – which left us wondering if something was broken. The differences are subtle, but the photo on the right was newly created using Auto Awesome’s “Best Smile” feature. Then, huzzah! Upon revisiting our albums after a few hours, we noticed an animated GIF had appeared. And then, Google automatically created a new “best smile” photo from a set of similar photos. A second batch of photo uploads yielded an animated GIF instantly. It confirms that the software does continuously learn and adapt as Google’s algorithms scans your photos. (A small icon in the corner of a photo indicates that it’s a newly created Auto Awesome image.) But out of the hundreds of photos we uploaded that we thought could have benefited from some Google magic, there weren’t many to be found. To truly benefit from the new features you need to have a huge collection of photos to notice the effects. Uploading a few images won’t give you the desired experience. This reviewer rarely uses Google+. Most of my photos are stored mainly on Flickr (since 2005), so it was a slight challenge in getting enough photos uploaded to properly test out the new features. It wasn’t until we dumped hundreds of photos into our account that we were able to get a good sense of how effective the features can be. Our first impressions: There’s a lot of promise and some of the Auto Awesome features worked eventually, but they all need more refinement. Auto Highlight needs to do a better job in curating the photos it displays, while the seemingly magical Auto Enhance isn’t 100-percent foolproof. When we watched the demo of the features, we were excited and couldn’t wait to try them out. After all, never having to dabble with Photoshop or any photo editing software would be great for casual users. However, the infancy of these new technologies left us wanting more. Plus, if Google hopes to convert users from Facebook or Flickr, we wish there was a way to easily export from our existing albums to Google+ (we understand competition, but we can dream, can’t we?). Granted, we took a quick early spin and it takes time for new features to come up to speed, so we can’t make a final judgment call, yet. We don’t doubt that these features work, and we are talking about Google. The nice part is that the software continues to learn and adapt as the photo collection grows, so here’s hoping that our second-take will yield a far better experience. In the meantime, we will continue to test out the features (some of Digital Trends’ Google+-loving staffers are already putting them to work on their photo collections) and provide you with updates as they come. Kudos to Google for adding some potentially great features to online photo hosting (Flickr should take note), but, as it stands, the features touted can oftentimes feel more gimmicky than useful.